Extensive selection of markings, well researched. Characteristic narrow waisted crosses included. 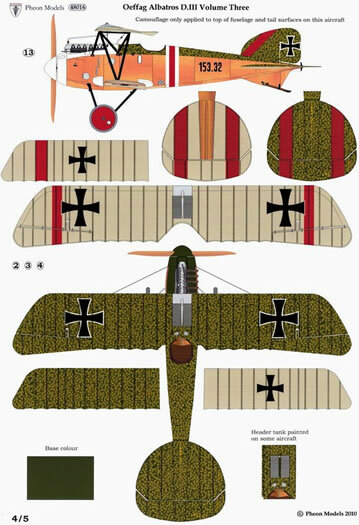 The latest release from Pheon Models is for Eduard’s Oeffag Albatros 253 “super kit” in 1/48 scale which has been very well received by WWI modellers. This kit uses Eduard’s new mould-making technology, bringing a whole new level of detail. 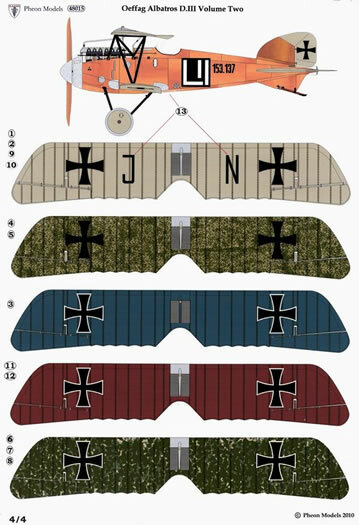 Other Oeffag Albatros kits in 1/48 scale include Eduard’s earlier 153 version, a Blue Max kit which is accurate and nicely detailed (and still available from Freightdog Models), and a much older Glencoe kit from the 1980s. The Austro-Hungarian manufacturer Oeffag built approximately 526 German Albatros D.III under license. There were three main series: 53, 153 and 253, using the 185, 200, or 225 hp Austro-Daimler engines respectively. Oeffag Albatros were an improvement over the German Albatros DIII due to modifications made to the lower wing which largely solved the structural problems and fitting of more powerful Austro-Daimler engine. Unique to the Oeffag version also was the winter cowling for cold weather operations which fully enclosed the cylinder heads. Beginning with aircraft 112 of the series 153 production run, Oeffag introduced a new rounded nose that eliminated the spinner. Wind-tunnel tests showed that the simple rounded nose improved propeller efficiency and raised the top speed by 9 mph. 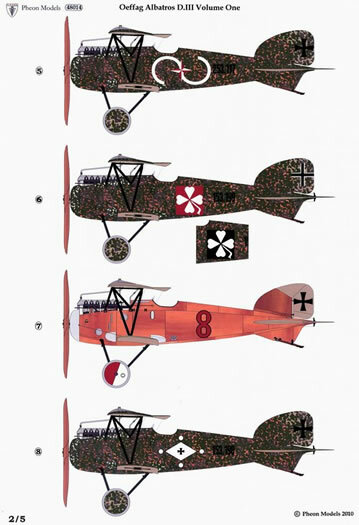 In service, the Oeffag aircraft proved to be popular, robust, and effective – the first truly modern fighter for the Austro-Hungarian airforce. 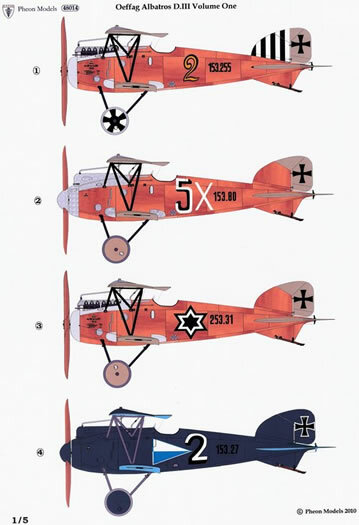 Across Pheon’s three volumes there are a massive *43* markings options covering all versions of the Oeffag D.III: the 53 series, the 153 series and the 253 series. All of these can be built from the parts included in the Eduard Oeffag 253 kit. 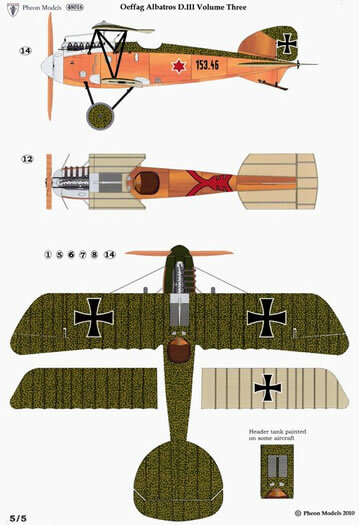 Volume 1 includes a marking option for the Oeffag D.II which could also be built from the kit with some kit-bashing of the wings with an Albatros DII. A slight modification is needed to represent the two-valve arrangement for the 185hp engine which features in a few of the options. 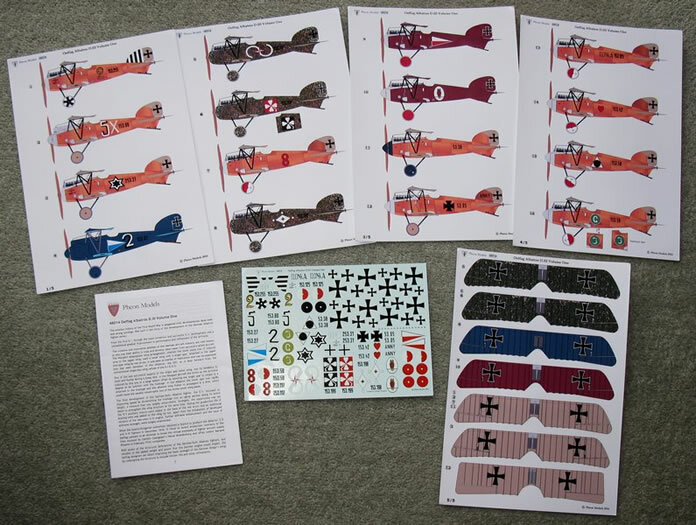 Pheon have avoided any duplication of subjects with Eduard’s Oeffag Albatros 253 kit. Three of Eduard’s 153 markings are duplicated. Pheon decals are printed by Fantasy Printshop in the UK. Quality is excellent, register is perfect and they lay down beautifully. Use of Micro Set softening solution is not recommended (nor required). 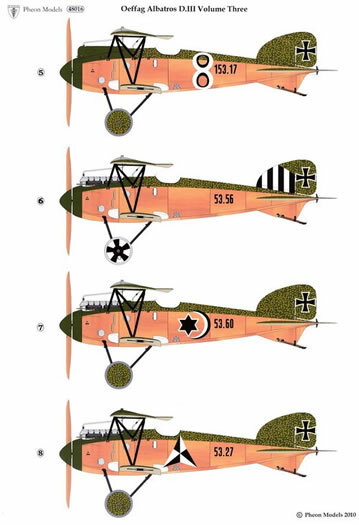 Pheon have provided the iron cross markings in the specific Oeffag style which is apparent in almost all photographs of these aircraft - notably thinner than the design specified by the Austro-Hungarian authorities. 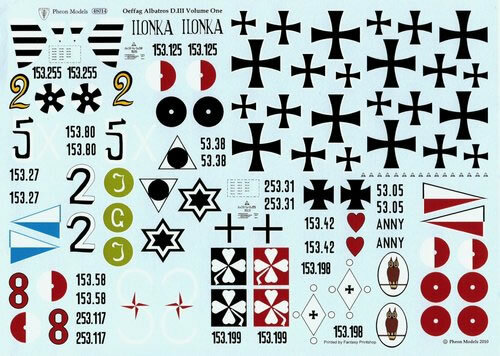 The crosses in the Eduard kit are wider waisted. 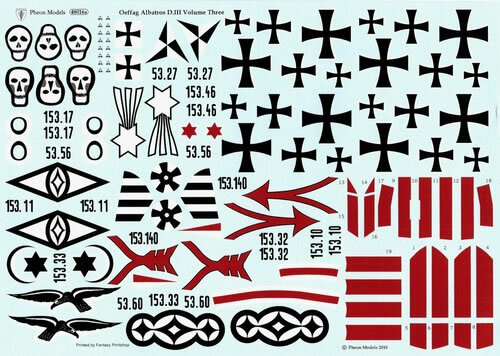 Enough crosses in both outlined and plain designs have been included on each sheet to complete four models. 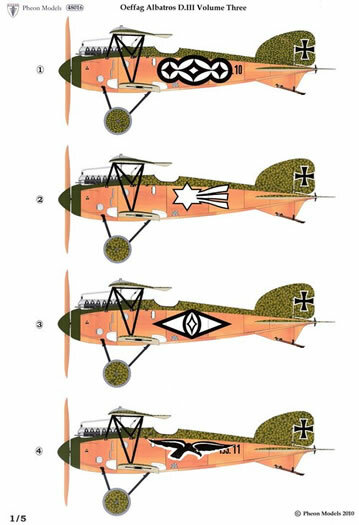 Volume 3 includes ‘sworl’ camouflage decals 'cookie-cut' to fit the Eduard kit, enough to complete two aircraft. Additional sets of the camouflage only are available separately as 48016b for £7.50. 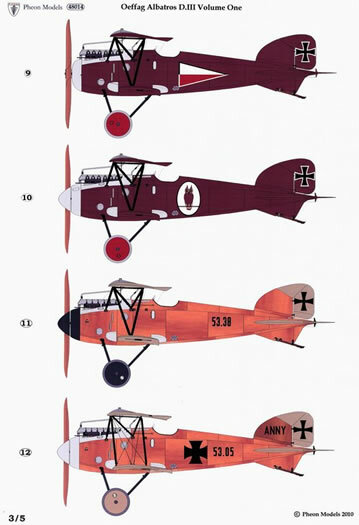 It was standard practice for Austro-Hungarian aircraft to be delivered in clear-doped linen and varnished plywood until well into 1918 and this was true for the Oeffag-built Albatros D.II and D.III fighters. Some unit commanders and acceptance parks applied their own painted finishes. 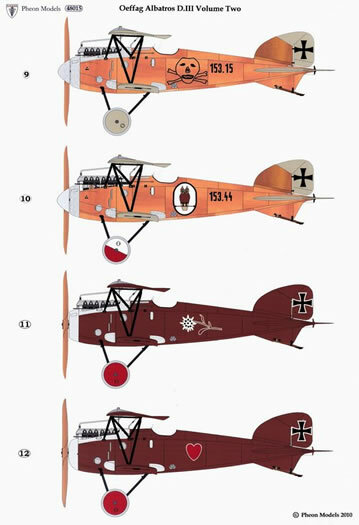 The late Martin O’Connor, the leading A-H aviation historian, has called the ‘sworls’ style the ‘Brumowski Distribution’ as it characterises aircraft flown by Godwin Brumowski’ and his unit during the time he commanded it. Initially the base colour was a fairly light, bright green for the 53 series Oeffag Albatros with the markings in mustard yellow. 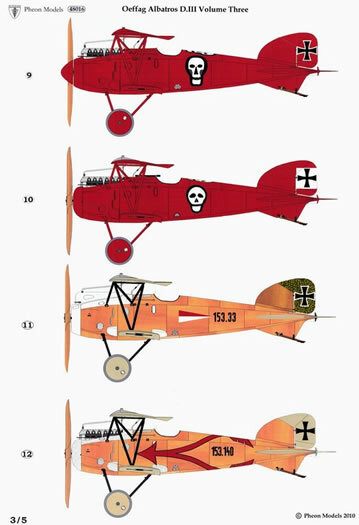 By the time the 153 Oeffag Albatros were introduced the base colour had become a darker green. 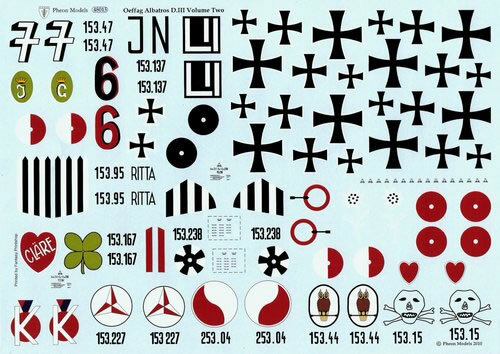 There is a minor issue with the sworl decals - in practice the painters carefully applied the sworls around the crosses which were already in place. Pheon have not left space for the crosses, which must be applied over the top of the sworls. For the most accurate finish some careful hand painting will be required to cover those sworls which are partly overlapped. 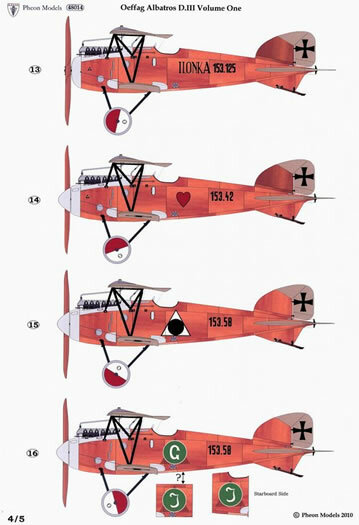 Brumowski actually had one of his all red aircraft, 153.52, smeared *all over* with smudges/blotches – this is the subject of one of the Eduard markings options in the Oeffag 153 kit. It would make an impressive model although it would take three sets of the sworl decals to provide sufficient coverage according to Pheon. 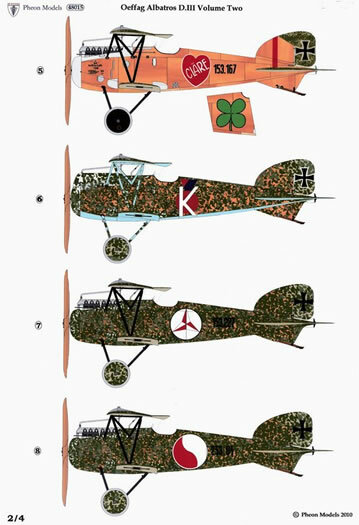 Three of the aircraft in Volume 1 are finished in a style of camouflage that has come to be called Summer Leaf. This was a dense pattern of paint splotches apparently applied with a rag over the plain finished upper and side surfaces. Pheon provide little guidance on these colours other than “two tones of green and of green and ochre colours”. This is because there is little guidance to be had! The source of many of Dr Martin O’Connor’s very specific colour references has subsequently been discredited. 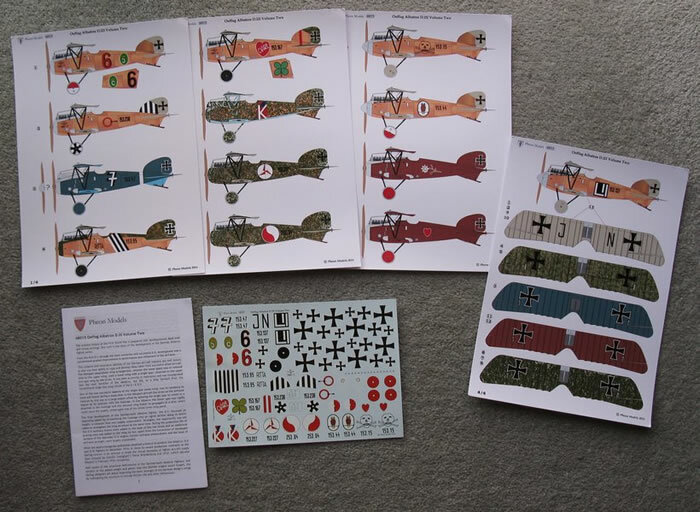 The 10 page A5 sized booklet follows Pheon’s standard layout: an interesting service history, comments on the kit, general colouring notes, references and decal application guide. 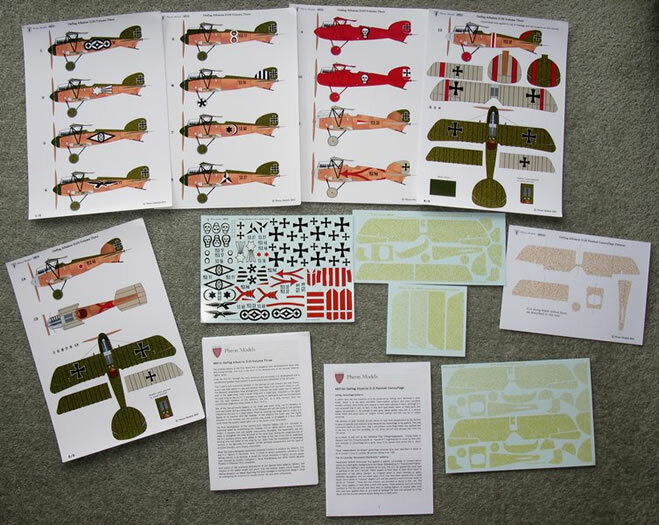 The individual pilot and aircraft details which normally feature in Pheon’s instruction booklets were not ready in time for the decals’ release at the UK nationals in Telford. At the time of writing Rowan is finishing this extra information and it will be included in future sets (and made available to existing purchasers). Marking options are featured in full colour on five A4 sized sheets of glossy photo paper showing decal placements (side profiles and top views). Very nicely done. 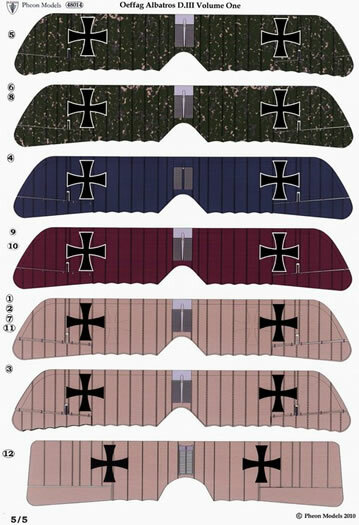 Oeffag Albatros colour schemes make ideal subjects for after-market decals, being very colourful and interesting. Pheon must be congratulated for such a comprehensive selection of markings. 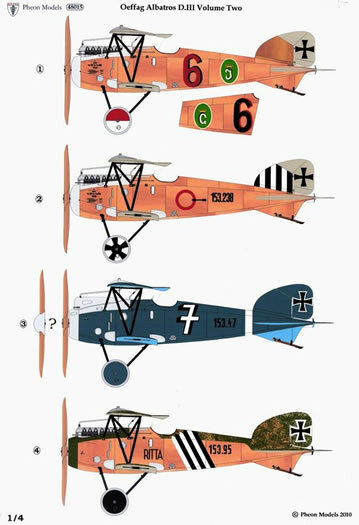 Combined with the beautiful Eduard Oeffag kit these decals will produce a stand-out model.